This is a photo of Baba Sukhdev Singh, a devout Gursikh who is always at the forefront in matters relating to Sikhi and who takes an active part in all humanitarian issues. 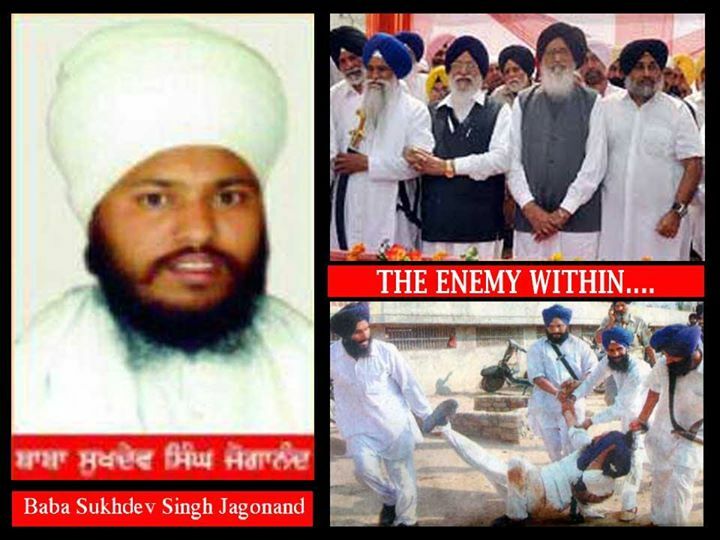 On Tuesday 29th September 2015, Baba Sukhdev Singh was arrested by Amritsar Police in the early dawn hours at 2.30am, from his village of Joganand in Bathinda. He was taken from his residence and along with the police came 15 to 20 thugs of the so-called SGPC ‘Task Force’. Why does the SGPC Head, Avtar Makkar, have the power and freedom to send his personal ‘army’ together with the state’s police department, to drag an innocent man out of his family home in the middle of the night? The reason why the Akal Takht jathedar Gurbachan Singh and SGPC leader Makkar have a direct hand in Sukhdev Singh’s arrest, is because Sukhdev Singh recently questioned Avtar Makkar regarding the decision made by the Jathedar in favour of cult leader, Gurmeet Ram Rahim. Instead of receiving an answer to his perfectly legitimate questions, Baba Sukhdev Singh has suffered organised violence at the hands of police and SGPC. More alarming is the fact that even today, his arrest has not been officially documented; he is being held in illegal custody and is being tortured. Any spirited Sikh who has a conscience will now have to face these situations. It’s time for the sangat to decide should the Guru’s home be freed from these ‘masands’/thieves?